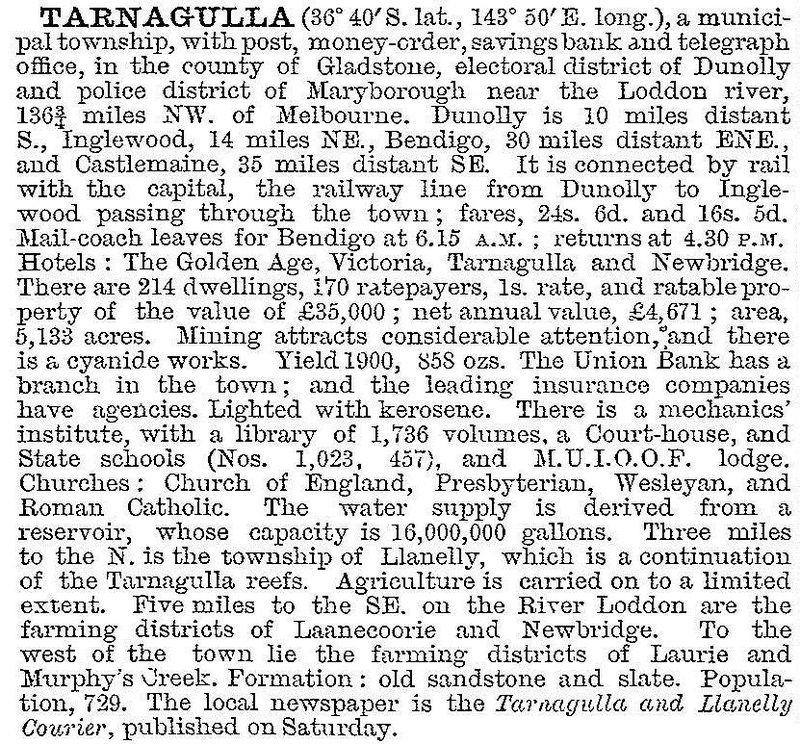 Tarnagulla is a rural township 40 km west of Bendigo and on the road and railway line (1888) between Dunolly and Inglewood. In 1852 gold was found in Sandy Creek, the remains of which are in the north of the Tarnagulla township. The Sandy Creek lead was particularly rich, yielding numerous nuggets. Further leads ran eastwards, and the Poverty Gully lead (named after Poverty Bay, New Zealand) became a mainstay of Tarnagulla's economy. The diggings and their township were known as Sandy Creek until 1859 and 1860 respectively, when the name was replaced by Tarnagulla. It is thought that Tarnagulla was derived from Aboriginal words referring to a river (perhaps Sandy Creek). There were the usual hotels and bush places of worship. The Victoria hotel and theatre (1861) remains from that time, converted to a public hall (1924). It is on the Victorian Heritage Register. A school was opened in 1858 along with a mechanics' institute, and a benevolent society was formed in 1861. In 1864 there were several important events in the town: the Tarnagulla borough council was constituted on 8 August and the permanent Anglican, Baptist and Presbyterian church buildings were opened. Within five years there were also permanent church buildings for the Catholics (1865), Wesleyans (1865-1975), Welsh (1867-93) and Primitive Methodists (1869-85). Between 1911 and 1921 Tarnagulla's population fell by about 300 to 411 people. The borough was united with Bet Bet Shire on 1 October 1915. A Back-to-Tarnagulla celebration in 1931 was a highlight, but within 15 years the population had fallen by about 40%. The agricultural and pastoral lands are not particularly extensive. The former mining areas mostly comprise State forest and the unmined areas west of Tarnagulla contain forest and bush reserves. Tarnagulla has a hotel, two of four large church buildings still in use, a golf course, a memorial park, a caravan park, historic hall and a museum in a former hotel. The public reserve and pavilion are on the Victorian Heritage Register and the school had 18 pupils in 2014. Former bank buildings and an old court house are privately occupied. Tarnagulla joined the National Broadband Network (NBN) in 2014. At the 2011 census, the median age of residents was 56 years, compared with Australia 37 years.